Crises reveal much about individuals, groups, and peoples. Certainly the true nature of faith comes to the fore. We venerate ancestors, great men of faith, and national heroes who faced great challenges with strong faith and character. Long after they are gone we draw from their strength. We Christians should use every available means to rebuild a Christian culture. Historic Christian literature offers a splendid opportunity for learning to apply Biblical principle to every endeavor. 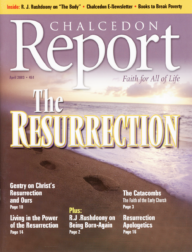 As every Christian knows, or should know, the resurrection of Jesus Christ and His ascension to heaven is a crucial and indispensable part of Christian theology. It is the miracle that proves Christ's being as the Son of God, the mediator between mankind and God the Father. Christians should and must be involved in politics, but we must remember that no good will come of our political activism if we do not understand and operate in the "power of His resurrection." Many religions compete for the allegiance of people, some more successfully than others. Only one religion, however, is rooted in historical facts: Christianity. The Christian hope is the resurrection, and what a blessed hope it is! Yet the resurrection cannot be considered the Christian's only hope. In 1954, Time Magazine's religion section included coverage of a Prayer Breakfast in Washington, D.C. Some 600 dignitaries, businessmen, and politicians met in the Mayflower Hotel for a "sturdy breakfast (grapefruit, scrambled eggs, sausage, ham, hominy grits and gravy)." When we come to the "question" of life after death, it is necessary for us to begin by dropping all the pagan ideas which prevail on this subject, most of them being summed up in the doctrines of ancient Greece.